Kids' Party Entertainments > V.
but a one of a kind entertainer. "V." can bring his show to your event, or right to your living room. His versatility allows him to seamlessly become a part of your team, making your event even better. With over 10,000 hours of stage experience, you are getting a consummate performer, that uses magic, showmanship, and technique to bring you a specialized performance, designed specifically for your audience. Since he is new to GigMasters, he is offering special discount to those first few clients to book his services. V's live show, "A Little Night Magic", can be seen every Thursday at 10:00pm on International Drive in Orlando. 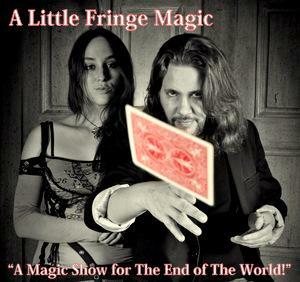 "A Little Fringe Magic with V" is exactly what it claims to be. Magician V performs the tricks you would expect with showmanship and skill. 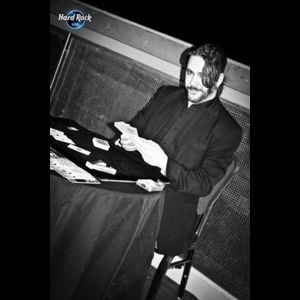 Rope tricks, card tricks, mentalist tricks, he knows them all. His manner is far from the aloof all-knowing "The Great Amazing Whoever" type magician. Instead, he's more the slightly nerdy guy at the party who just wants to be your friend. "Isn't that cool?" he exudes after a favorite trick. But that every-guy kind of delight makes his act more appealing. And he knows how to play to a Fringe-happy crowd. "These are ropes you might find in any bedroom across America," he begins one bit. Later, after passing a deck of cards around the audience for inspection, he announces it has been checked by "two and a half sober people" to the crowd's delight. His assistant Pseudo-Psychic-Psami -- every magician has a lovely assistant -- does a trick of her own and participates in the mentalist portion of the program. 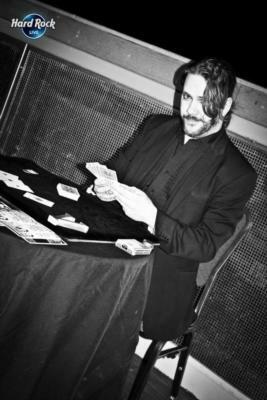 That reminds me that V is the first magician I've ever seen to include a public-service message in his routine. He's at great pains to remind the audience that he can't really read our minds and no one should hand over money to people who claim to see the future. See, he cares about us. He's our buddy. The charm is all part of his magic. Please note V. will also travel to North Las Vegas, The Lakes, Henderson, Blue Diamond, Boulder City, Jean, Indian Springs, Overton, Dolan Springs, Moapa, Logandale, Tecopa, Pahrump. SHOWGIRLS - Hire real Las Vegas Showgirls.